Hear Humph and the team setting up before and after a recording, catch the jokes intended only for the theatre audiences (including the naughty bits! ), listen to Barry and Graeme as "Alec & Denzil", early ancestors of their much-loved Hamish & Dougal creations, and thrill to Jeremy Hardy's first ever attempt at singing on the programme. Clue producer Jon Naismith introduces each programme, with additional material provided by Mrs Trellis of North Wales. Warning: contains some swearing! This is as close to actually attending a live recording of I'm sorry I haven't a clue as the majority of those of us now living on the US side of the pond will ever come. For non-UK folks: You really need to be a serious 'Anglophile' and well versed in modern UK news and affairs to get some of the humour. 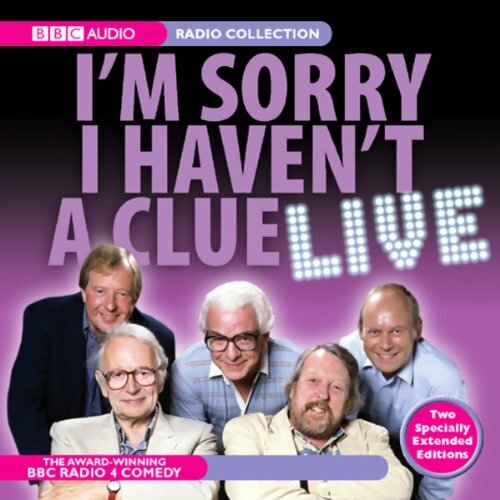 That said, this show has been a bright jewel in the BBC's radio comedy output for over 30 years. Buy this audio for an insight into the making and mechanics of the show, You might also like to listen to current series shows found at the BBC's Radio 4 website or even the occasional classic repeats on the BBC 7 website. As an avid listener of ISIHAC this was a joy to listen to. Apart from the fact that you get 2 full shows these unedited versions (which include pre-show chat, re-takes and a a great scene setting preamble from the producer) offer a great insight to what it is like to be in audience on the night the show is taped. It was great to hear Willy Rushton on the panel (I had not been a listener when he was originally on the team) and apart from the fact that it is still consistently the funniest thing on the radio the candid moments add a new level of enjoyment to the programme. I hope this is the first of many such 'Live' releases as I can't wait to hear more. The usual considered debate and philosophical insights, drawn heavily from Kafka and Austen with the occasional nod to Brahms. Where does I'm Sorry I Haven't a Clue Live rank among all the audiobooks you’ve listened to so far? Be wary if listening to this book whilst in public. You will end up laughing out loud suddenly and sitting with a grin on your face for the rest of the time. Some unsuspecting soul may give you with a dirty look or a look of tolerance tinged with pity. I know 'cos this has happened to me. But guess what, I don't care. My reaction to the end was to go back to the beginning and start again. What did you like most about I'm Sorry I Haven't a Clue Live?